It’s not often that a truly category-changing product comes along. Products like single wall tents, Nomic ice tools and LED headlamps were so innovative that they radically changed the landscape of their categories. Light weight climbing packs though are all relatively the same: some nylon cloth, a couple shoulder straps and not too many extra bells and whistles. What differentiates Arcteryx’s new Alpha FL climbing packs is that they are waterproof while still being tough and light weight. 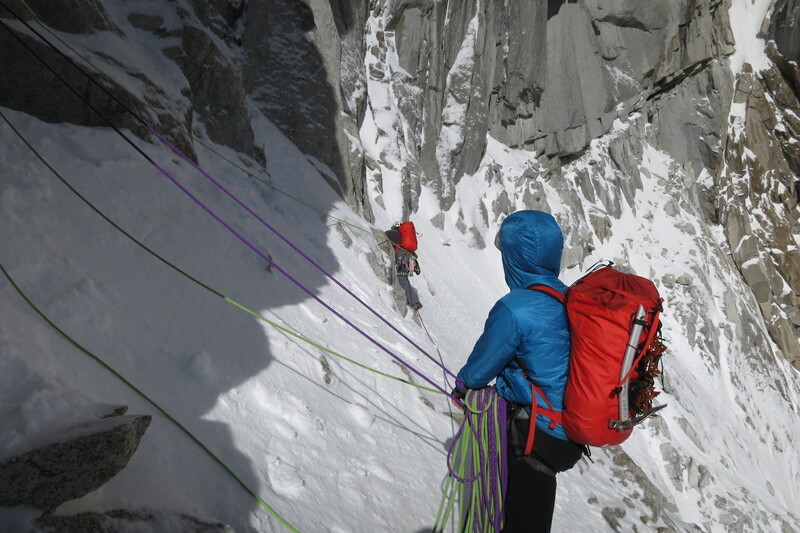 They are an alpine climber’s dream. The Alpha FL (“Fast & Light”) Pack is a new climbing oriented backpack that is available in both 30L and 45L capacities. The bag uses Arcteryx’s AC2 seam welding technology, combined with a burly fabric to make a streamlined and waterproof backpack clearly designed for the requirements of alpine climbing. When I first saw a prototype of this pack a couple years ago, it was obvious that it was a unique addition to the climbing pack space. It had super simple exterior fixtures, a narrow/tall profile and after having just been hauled up Torre Egger’s south face, it looked nearly unscathed. What I like about this pack is that the fabric is extremely durable, it creates a waterproof seal for my gear, and that the fit is narrow and strap-free. It also climbs really well! On lead, the comfort of the pack is really exceptional. Overall it is quite light weight and, having paired down features to the minimal set for climbing, there is nothing to strip off the pack to make it a “summit pack”. The Alpha FL’s do not have top lids, which is a feature that I am a big fan of. Generally a top lid just adds extra straps, extra time to get into the bag, and often can make the pack off balance if overfilled. Getting food or water out at a belay or off your partner’s back is quick and easy. For external storage, the FL does have a small zip pocket, but when the bag is fully loaded it is very difficult to get anything in or out of this pocket. I think having a small pouch on the inside of the bag near the top would be more useful. At first I wasn’t sure what I thought about the dry-bag like roll top closure skirt, but its worth slowly grew on me. If the bag isn’t full, a quick stuff is all that’s needed to keep spindrift out. No more dealing with two drawcords (one for the skirt and one for the bag). The skirt also allows you to over stuff the bag, and the rope strap is long enough to stabilize the load when fully packed. Finally, if the bag is under stuffed, you can just reverse the skirt into the bag, and it behaves as if it wasn’t there. One thing to note about Arcteryx’s sizing: the 45L size is with the pack fully filled and the skirt extended. With the skirt inverted into the pack, it’s more like a 35L pack in size. Another thing to note on the fabric is that while it has excellent abrasion resistance, our testers did experience some micro-punctures between the ripstop grains on the bottom of the pack when it was set on very sharp granite. It is something to be aware of to maintain the waterproofness of the bag. In future versions this area could probably be reinforced with a film laminate or a screened application to help strengthen that often abused part of the pack. Carrying a really heavy load is one place where this pack does not excel. There is no suspension, no padding on the waist belt and the shoulder straps are relatively thin. 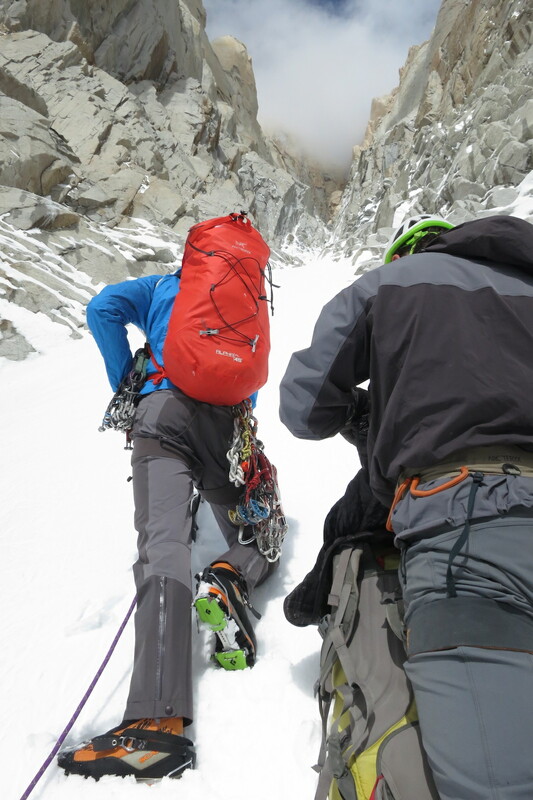 In testing, I carried a full ice and mixed load into a remote 3 day climb, which was uncomfortable at times. The pack did mold to my lower back really well though, which helps in multi-day comfort quite a bit. Adding a removable pad to the waist belt, like what was done with the older Nozone packs, could help, but would add weight. In all, this is a true alpine climbing pack that prioritizes ruggedness and light weight over comfort and that is a tradeoff I’m definitely willing to make. After having used both the 45L and the 30L on everything from multi-day climbs to cragging, I think that they are amongst the very best climbing packs currently made. The only thing missing is an 18L version, which would be the ultimate mini day pack for climbing. Essentially a burlier cousin to the fantastic Cierzo 18L pack. What's in the Ultimate Cascades Daypack?